This Island Pecan Pie is loaded with pineapple, coconut, and pecans in a delicious creamy filling. The original recipe comes from a famous pie diner in Arkansas. 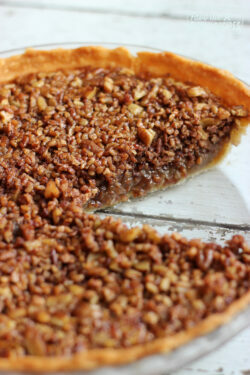 You have got to try this Island Pecan Pie!! For Thanksgiving this year I wanted to try something new in the pie world. I was searching all kinds of pecan pies on pinterest and saw this pineapple coconut pecan pie that I knew I had to have! Unfortunately the pin just linked to a picture and not a recipe, but after doing more searching on the internet I finally found the exact recipe! Apparently this is a famous pie in a diner in Arkansas. And after making it, I know why. It is seriously amazing! And now you can have the recipe too without all of the search work. You will need an unbaked pie crust for this recipe, we have a great recipe for one HERE. Every bite of this pie is delightful. It is not as heavy as a traditional pecan pie. 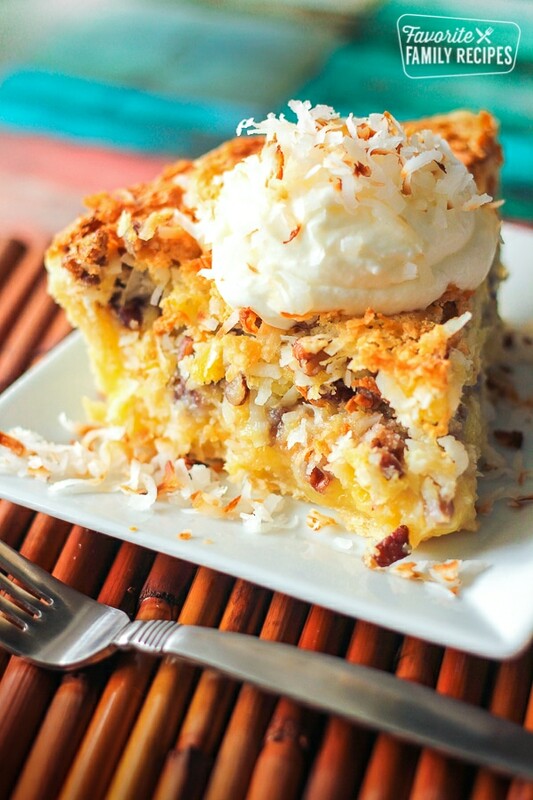 It is more creamy, like a cream pie, but with the sweet chunks of pineapple and the crunch of the pecans and coconut. It has so much flavor! You will see in the recipe that I used a homemade whipped topping. I highly recommend doing this! I made a basic whipped topping with heavy cream, sugar, and almond extract. The almond flavor really complements this pie. This pie is fun to add to the traditional Thanksgiving pies we all love. It is unique and something new for everyone to try. In addition to Thanksgiving, it is also a great addition to an Easter dinner to serve along with a coconut cream pie and banana cream pie. With the tropical flavors of pineapple and coconut, it is also delicious in the summer. Come to think of it, this pie is great to serve any time of the year! 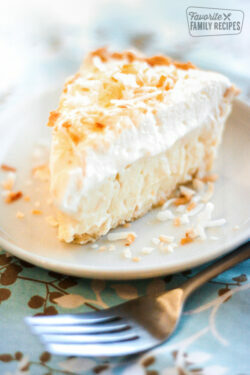 Coconut Cream Pie – Coconut Cream Pie is a dreamy island dessert with a flaky crust, coconut filling that is made from scratch, and toasted coconut sprinkles. 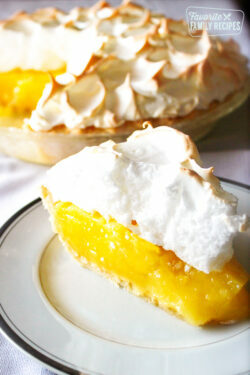 Creamy Lemon Pie – This Creamy Lemon Pie is packed full of tart, lemon flavor and creamy goodness. This recipe is super easy to make and is always a crowd pleaser! Butterscotch Pie – This creamy butterscotch filling is spread into a flaky pie crust and drizzled with butterscotch topping then sprinkled with butterscotch chips. It’s basically a butterscotch lovers dream. 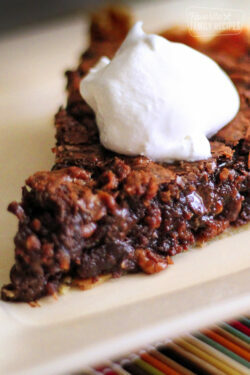 German Chocolate Pie – This pie recipe comes straight from Amish country. The rich, gooey, chocolate filling is to die for! Key Lime Pie – Straight from Savannah, Georgia, this pie is smooth and creamy with the perfect blend of tart and sweet. Beat the sugar, corn meal, flour, eggs and salt together. Gently stir in the pecans, pineapple and coconut (don't beat it). Pour mixture into an unbaked pie shell. Bake at 300 degrees for approximately 50 to 60 minutes. Cover the crust edge with some aluminum foil to keep it from burning. Cook 15 to 30 more minutes, or until the pie is set. Allow pie to cool and then refrigerate until ready to serve. With a mixer, whip heavy cream until soft peaks form. Add sugar and almond extract. Continue to whip until stiff peaks form or until it reaches your desired consistency. WOW – this looks amazing! Pinned and sharing on my Facebook page later this evening! Can’t wait to try this! Can you use self rising corn meal as well? Yellow or white meal? I haven’t tried that, but I don’t see why not? I used self rising flour anď self rising corn meal mix because that is what I had on hand. I left out the salt because both already had it in them. I also used salted butter. I decided that the pie shell would not hold all the mixture, so I divided it in half and ended up with 2 pies. Baked the same amount of time. Tasty!! Thank you for sharing your adaptions to this recipe, Linda! It shows two cups of heavy cream in the filling but the instructions don’t mention them except for two in the topping? For some reason it was displaying the ingredients for the whipped topping twice. I fixed it on the recipe. Theres no heavy cream in the pie filling. Wow! Good to know! The recipe does make a ton of filling. Thank you for sharing! What did you put on top?? I just did whipped topping, and I mixed in a little almond extract. 🙂 Then I toasted some coconut to sprinkle over the top. hi,looks great! if i just buy a bag of flaked coconut,am i buying sweetened or unsweetened?thanks! You could do either, I did the sweetened. hi,is the cornmeal essential?i cant find that here in australia,or maybe a substitute suggestion?thank you! Corn starch would work too. Corn meal? Just wondering if you meant corn syrup, which is in traditional pecan pie? Or corn starch for thickener? If not, what is the purpose of corn meal?? Yep. its corn meal! It acts as a thickener, but you can sub out with corn starch if you want. I live in Florida and want to add this tropical pie for Thanksgiving. self-rising or all purpose cornmeal??? All purpose corn meal works great. Your guests are going to love this pie! Have a Happy Thanksgiving! Do you think this would work without the pineapple and what substitutions would I need to make? Thanks! Yes, leaving out the pineapple would be fine. I would maybe try subbing it for something else like banana or another fruit. Maybe some dark chocolate mini chips?? I made this pie last night. It is WAY too sweet! –Will it mess up the recipe to use only one cup of sugar? Yes, it needs to be refrigerated but it would be fine on your drive. Especially if you keep it in a cooler. Do you bake it 50-60 minutes and then cover the crust and bake for another 15-30 minutes?? So it could possibly take up to 1.5 hours? Does this make just one pie? Thanks! Yes on the time, because it is cooked on such a low heat. Cooking times ail vary based on elevation and ovens. Yes, it makes 1 pie. It will be very full. You could definitely split it into 2 and your cooking time would be shorter. Yes, it shouldn’t be liquid-y and jiggly. Hope this helps! just regular flour, you can use white or wheat flour. But is it self rising or Plain flour? I made this pie. The mixture was too much to fit in the ready made crust that I bought so I divided what was left after the pie into two ramekins and baked it along with the pie. The ramekins were done about the time the foil went on the crust. Waste not want not. Yum! doubly good. could you use 3 eggs instead of 5? The picture looks a little dry. Is it or is it just me? It’s definitely not dry, it maybe just appears that way. Can you use brown sugar instead of white? I haven’t tried that but let me know how it works! What size can of pineapple do you use? You only need a cup, so I would get a can with more than 8 oz. Did you blind bake the pie shell prior to filling? Nope, the pie crust is unbaked prior to cooking. Looks delicious your whipped topping is that cream that is whipped till thick. Thank you Emily will definitely make it I know my family will love it. Thanks! You will definitely love it, it’s one of my favorites!! I have made it multiple times, I promise there isn’t an eggy taste. I love anything that starts with pineapple, coconut and pecans so I can’t wait to try this! Thanks for doing all the work and graciously sharing it with us!! You are our kind of girl! We hope you like the recipe. Thank you for visiting our site! I’m making this pie tomorrow too! So glad you like it, it’s one of my favorites! No one in my family particularly likes pue crust. But they do like graham cracker crust. Do u think I can make this recipe for them using a graham cracker crust and also using a 9 ×13 baking dish? If that is what your family would prefer, I would say: “Go for it”! Let us know how it turns out! Hi Emily, I’ve had this saved to try for a while. We are having my Dad’s 90th birthday party soon and I’d like to try this for part of the three day menu. However, there are going to be so many people that will want to try it–this is what I’m wondering???? What do you think about doubling the recipe and putting it into a 13 x 9 dish without a crust? Will it be too hard to cut this method? If it absolutely needs a crust, what about a shortbread type crust??? I’m not sure, I have never tried that! I would probably do some sort of crust along the bottom of the pan. If it were me, I would probably just make 2 pies. Got this recipe from my husbands Aunt, about 20 yrs ago ( minus the pecans). Lost my recipe book it was in & Aunt passed away. Asked everyone in the family & no one knew what I was talking about. Recipe book was found & have enjoyed the pie. Will make note of adding pecans. I also cut coconut in 1/2 (not a real big fan) & up the crushed pineapple by same amount. Still very very good!! What a good idea! Thanks! I made this pie two days ago. My husband is not big on pies, but he loved this one! Don’t you hate when people make substitutions? Sorry! I didn’t have pecans, so I put in chopped walnuts. Still delicious, but I will use pecans next time. Also, as some of the others said, I had enough filling to make two pies! Surprise! I wonder if I just mixed it too much (as you said you didn’t want the eggs to fluff) or if it is possible to cut the recipe in half next time? I used sugar and I wonder about using the Splenda Baking Blend next time. I liked the idea of subbing in some apple sauce for some of the sugar as suggested above, too. Oh, I thought the crust would get too soggy with the filling, so I put it in the oven for about 5 minutes before adding the filling. It didn’t really bake it, but it firmed up the bottom just a bit. Maybe next time I will try it as you advised since the comments don’t seem to criticise the crust for getting soggy. Haha! No, we don’t hate it when people make substitutions. It’s fun to try new things and you’ve got to use what you have on hand. I’ll do just about anything to save myself a trip to the grocery store to get just one thing. Delicious! I made for a euchre game and every body ask for the recipe. Thank you for the feedback! We are so glad it was a hit! thanks for sharing recipe, would you also have a recipe for a hawaiian fruitcake, yellow, not dark.it has pineapple,coconut, macadamia nuts? No, we have a Hawaiian wedding cake though. Thanks for sharing the recipe! It came out really good i think! If I made it tonight for tomorrow should I put it in the frog over night? Yes, I always keep it in the fridge. Hope the frog isn’t too full. OMG!! HAHA!! I LOVE PEOPLE!! Has anyone tried this with no pie crust? I’, thinking there are many eggs in this recipe and makes it similar to a quiche. I routinely make quiche with no crust since the eggs set up beautifully without a pie crust. Wondering what would happen with no crust. Any thoughts? ( flour and cornmeal) making all those eggs set up. I’m not sure, I’ve made it numerous times and it has always turned out. Did you drain the pineapple? I saw your comment and wanted to email to see if you ever fixed your problem? Same thing happened to me. I took it out after 1.5 hour, left it to set and when cut it, was shocked, it was all watery. I threw it away. I followed the recipe to a T, drained pineapple, all that. I want to try again but kind of scared now. Ho do you test it if it’s ready? By poking it from time to time? Should it maybe stay 2 hours in the oven? How would one know it’s time for it to come out, to avoid the ‘loose pie’ problem? I’m so sorry, it’s hard to say what went wrong. Maybe next time try just dicing up some fresh pineapple instead of using the crushed pineapple, then don’t pull it out of the oven until you can lightly press the center and it doesn’t feel runny underneath. This looks so delicious! Going to try this very soon. Can’t help but wonder if chocolate chips would be a tasty addition?! Thanks for sharing this! You can definitely add chocolate chips if you need your chocolate fix! We haven’t done it that way before but I don’t see why not! I have a question. A lot of the recipes on this site call for flaked coconut. Are these recipes using sweetened flaked coconut? Yes, all of them are sweetened unless otherwise noted. Hope this helps! Can you use another fruit besides pineapple I would love to make this but have a daughter with severe pineapple allergy? My daughter has made this twice. First time followed exactly. Did not come out firm. 2nd time she increased baking time. Still not firm but very good. She did drain pineapple. Any reason as to it being runny? I’m not sure why, my suggestion would be to cut the amount of pineapple next time. Maybe try doing 3/4 of what you would normally do. Hi, I tried making this, and also found that I had enough filling for two pies. I think you may want to specify the size of eggs you used. I only ever have large or extra large in the house, so I used 4 instead of the 5 you state, just in case you use a smaller size. And I still had a LOT of filling. I love the idea of the filling, but with the amount of sugar you are using, unsweetened coconut may help cut the sweetness others have experienced. Could this pie be frozen? I have not tried freezing this pie, but you can freeze pecan pie and I don’t think there would be much difference. Wait until the pie is completely cool. Cover it well with plastic wrap and then foil. Thaw in the refrigerator overnight. Thank you for asking! Can you use a frozen pie crust? Great recipe, delicious rich and decadent pie. Hubby and I ate half the pie in one sitting. Makes a big pie so I used my 10 inch pie dish. I placed a pie of parchment in the bottom before adding the filling which gave me a nice browned bottom on the crust. I did add one tsp of good vanilla. I can’t wait to try this pie! Is the pie crust regular or deep dish? I’m not really sure what you mean, but the crust lines the bottom and sides of the pie pan. I am going to try this! That’s a great idea! This sounds amazing. Do you think substituting almonds for the pecans would work? I have a severe allergy to pecans and walnuts but can eat almonds. TIA!!! I’m sure you could! Almonds would go great with the coconut. It would just be like an Almond Joy! I have an allergy to corn, gives me terrible migraines. Do you think I could use almond meal instead? Or even just regular flour? I haven’t tried that, but I don’t see why that wouldn’t work. Let me know how it goes if you do try it! I’ve made this for the holidays for the past three years. My hubby absolutely loves it! I always double the recipe, and that usually makes 3 pies. I’m so glad you like it! Thanks for the 5-star rating!! Absolutely delicious. Made this pie this afternoon. Followed the recipe exactly, and it turned out perfect. I used a deep dish pie plate, baked per the recipe. Will definitely make this again. I’m so happy you liked this pie! The flavors are so delicious. Thank you for the 5 stars!